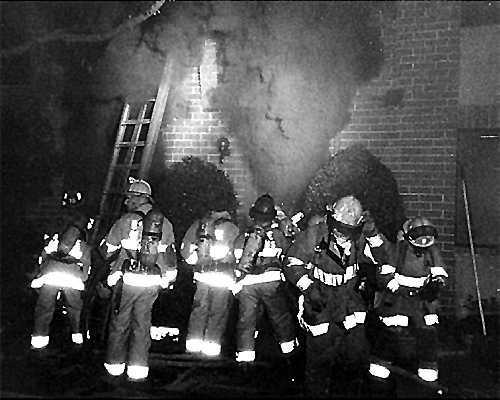 This post continues study of an incident in a townhouse style apartment building in Washington, DC with examination of the extreme fire behavior that took the lives of Firefighters Anthony Phillips and Louis Mathews. Prior posts in this series, Fire Behavior Case Study of a Townhouse Fire: Washington, DC, Townhouse Fire: Washington, DC-What Happened,and Townhouse Fire: Washington, DC-Extreme Fire Behavior examined the building and initial tactical operations at this incident. The fire occurred in the basement of a two-story, middle of building, townhouse apartment with a daylight basement. This configuration provided at grade entrances to Floor 1 on Side A and the Basement on Side C.
Engine 26, the first arriving unit reported heavy smoke showing from Side A and observed a bi-directional air track at the open front door. Engines 26 and 10 operating from Side A deployed hoselines into the first floor to locate the fire. Engine 17, the second due engine, was stretching a hoseline to Side C, but had insufficient hose and needed to extend their line. Truck 4, the second due truck, operating from Side C opened a sliding glass door to the basement to conduct search and access the upper floors (prior to Engine 17’s line being in position). 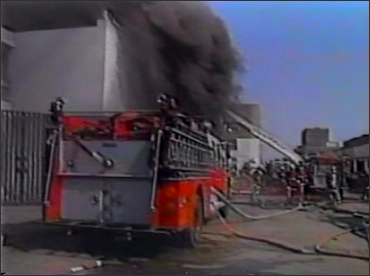 When the door on Side C was opened, Truck 4 observed a strong inward air track. As Engine 17 reached Side C (shortly after Rescue 1 and a member of Truck 4 entered the basement) and asked for their line to be charged. Engine 17 advised Command that the fire was small. Conditions changed quickly after the door on Side C was opened, as conditions in the basement rapidly transitioned to a fully developed fire with hot gases and flames extending up the interior stairway trapping Firefighters Phillips, Mathews, and Morgan. 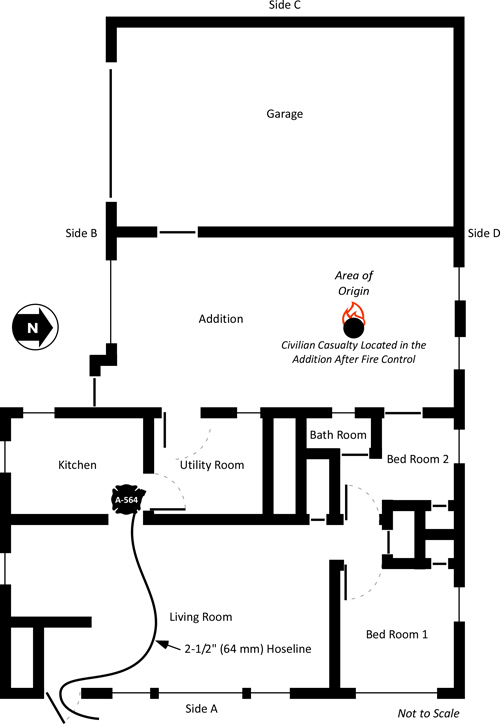 Confusion about building configuration (particularly the number of floors and location of entry points on Side A and C) delayed fire attack due to concern for opposing hoselines. 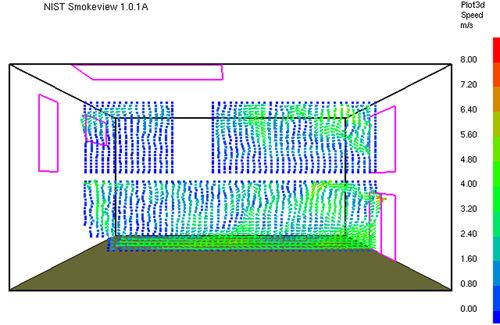 National Institute for Standards and Technology (NIST) performed a computer model of fire dynamics in the fire at 3146 Cherry Road (Madrzykowski and Vettori, 2000) using the NIST Fire Dynamics Simulator (FDS) software. 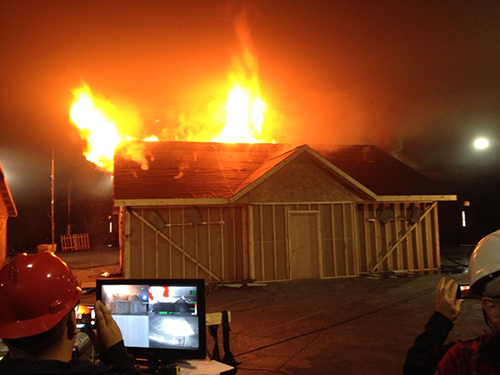 This is one of the first cases where FDS was used in forensic fire scene reconstruction. Fire modeling is a useful tool in research, engineering, fire investigation, and learning about fire dynamics. However, effective use of this tool and the information it provides requires understanding of its capabilities and limitations. 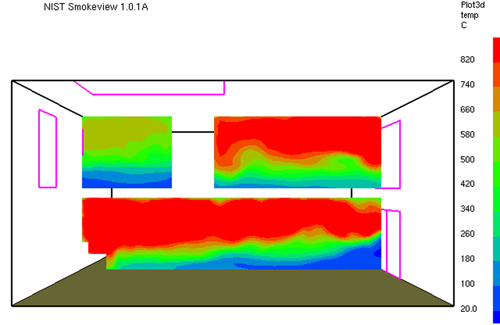 Models, such as the National Institute of Standards and Technology (NIST) Fire Dynamics Simulator (FDS) relay on computational fluid dynamics (CFD). 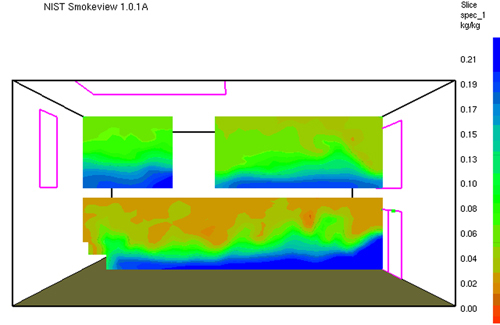 CFD models define the fire environment by dividing it into small, rectangular cells. The model simultaneously solves mathematical equations for combustion, heat transfer, and mass transport within and between cells. 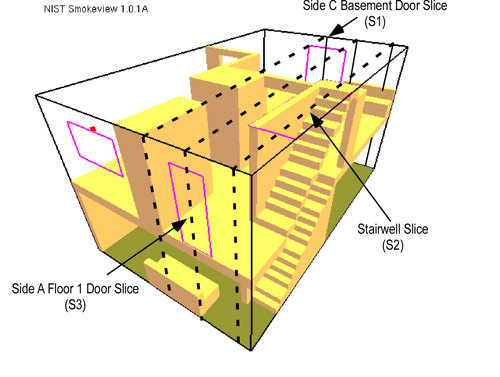 When used with a graphical interface such as NIST Smokeview, output can be displayed in a three-dimensional (3D) visual format. Models must be validated to determine how closely they match reality. In large part this requires comparison of model output to full scale fire tests under controlled conditions. 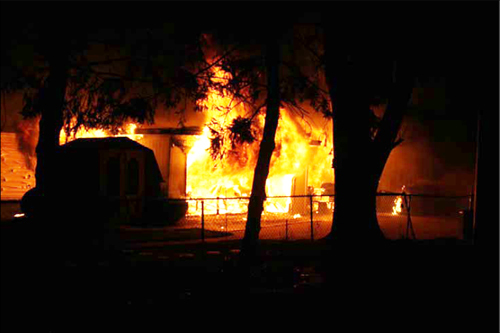 When used for forensic fire scene reconstruction, it may not be feasible to recreate the fire to test the model. In these situations, model output is compared to physical evidence and interview data to determine how closely key aspects of model output matched events as they occurred. If model output reasonably matches events as they occurred, it is likely to be useful in understanding the fire dynamics involved in the incident. FDS output included data on heat release rate, temperature, oxygen concentration, and velocity of gas (smoke and air) movement within the townhouse. As indicated above, model output is an approximation of actual incident conditions. In large scale fire tests (McGrattan, Hamins, & Stroup, 1998, as cited in Madrzykowski and Vettori, 2000), FDS temperature predictions were found to be within 15% of the measured temperatures and FDS heat release rates were predicted to within 20% of the measured values. For relatively simple fire driven flows such as buoyant plumes and flows through doorways, FDS predictions are within experimental uncertancies (McGrattan, Baum, & Rehm, 1998, as cited in Madrzykowski and Vettori, 2000). 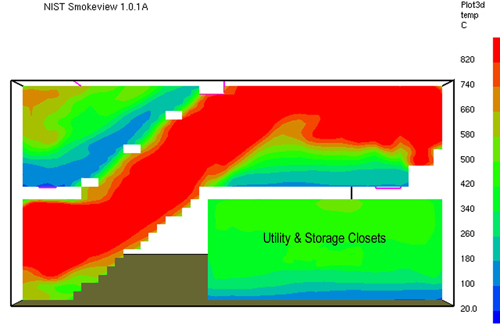 Results presented in the NIST report on the fire at 3146 Cherry Road were presented as ranges to account for potential variation between model output and actual incident conditions. 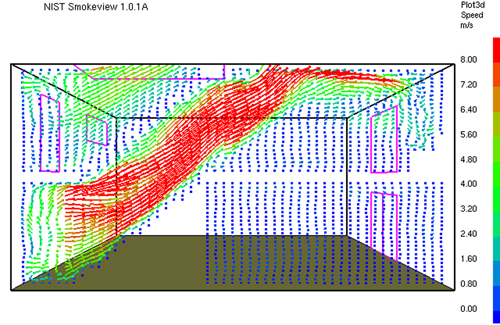 In this incident there were a number of changes to the ventilation profile. 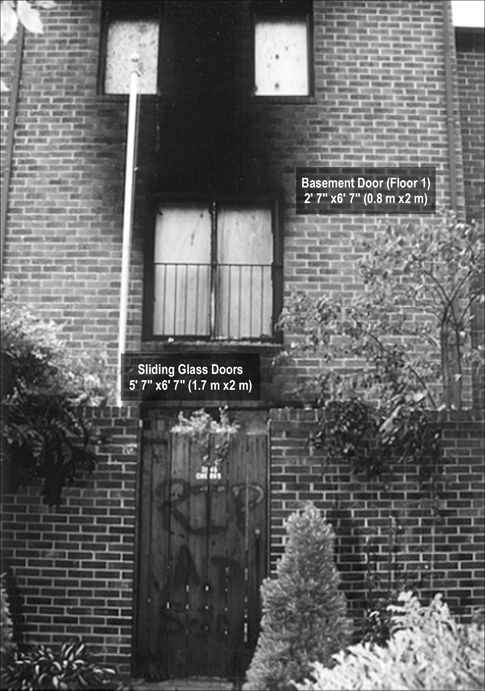 Most significant of which were, 1) the occupant opened the second floor windows on Side C (see Figure 3), 2) the occupant left the front door open as they exited (see Figures 1 &2 ), 3) tactical ventilation of the first floor window on Side A, and opening of the sliding glass door in the basement on Side C (see Figures 1-3). 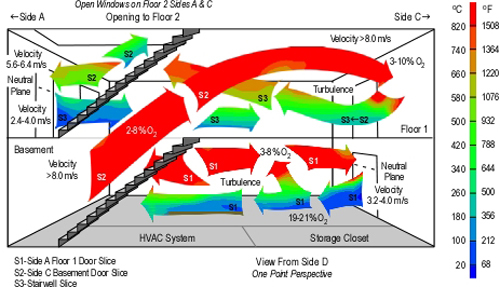 In addition, the open door in the basement stairwell and open stairwell between the Floors 1 and 2 also influenced the ventilation profile (see Figure 1). 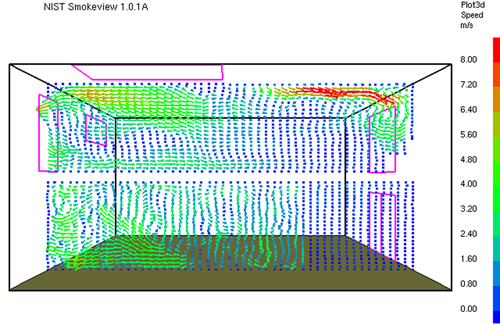 Figure 4 illustrates the timing of changes to the ventilation profile and resulting influence on heat release rate in modeling this incident. A small fire with a specific heat release rate (HRR) was used to start fire growth in the FDS simulation. In the actual incident it may have taken hours for the fire to develop flaming combustion and progression into the growth stage. 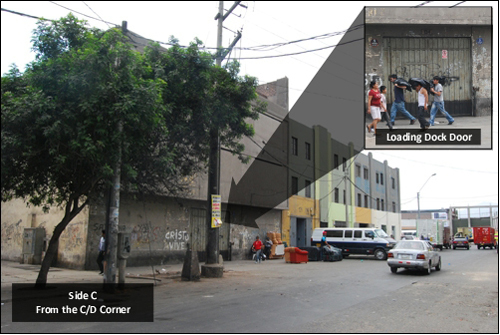 Direct comparison between the simulation and incident conditions began at 100 seconds into the simulation which corresponds to approximately 00:25 during the incident. 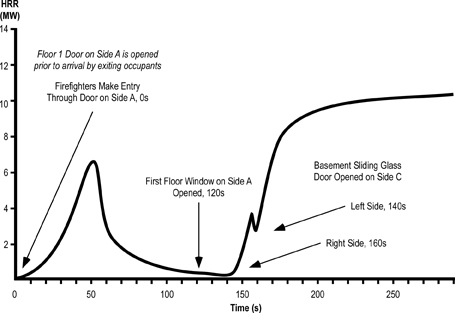 Note: Adapted from Simulation of the Dynamics of the Fire at 3146 Cherry Road NE Washington D.C., May 30, 1999, NISTR 6510 (p. 14) by Dan Madrzykowski and Robert Vettori, 2000, Gaithersburg, MD: National Institute for Standards and Technology. The following questions are based on heat release rate data from the FDS model presented in Figure 4. What was the relationship between changes in ventilation profile and heat release rate? What would explain the rapid increase in heat release rate after the right side of the basement sliding glass door is opened? Why might the heat release rate have dropped slightly prior to opening of the left side of the basement sliding glass door? Why did the heat release rate again increase rapidly to in excess of 10 MW after the left side of the basement sliding glass door was opened? 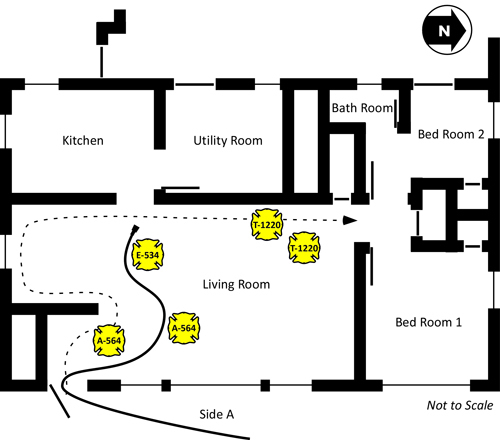 How does data from the FDS model correlate to the narrative description of events presented in prior posts about this incident (Fire Behavior Case Study of a Townhouse Fire: Washington, DC, Townhouse Fire: Washington, DC-What Happened,and Townhouse Fire: Washington, DC-Extreme Fire Behavior)? 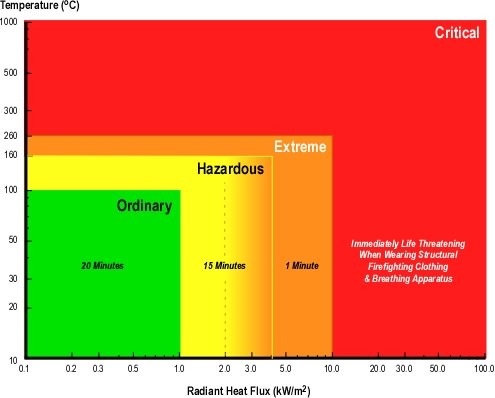 In addition to heat release rate data the computer modeling of this incident provided data on temperature, oxygen concentration, and gas velocity. 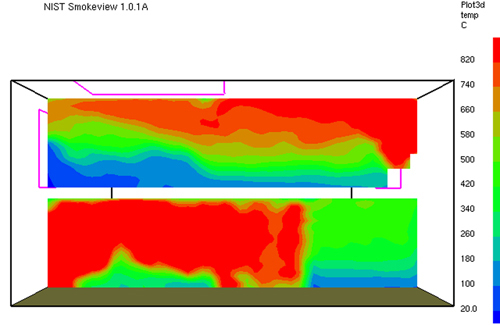 Visual presentation of this data provides a more detailed look at potential conditions inside the townhouse during the fire. The next post in this series will present and examine graphic output from Smokeview to aid in understanding the fire dynamics and thermal environment encountered during this incident. 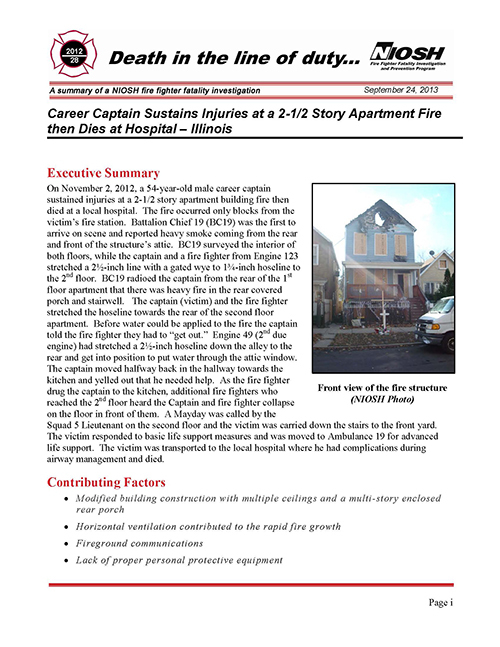 Prior posts in this series, Fire Behavior Case Study of a Townhouse Fire: Washington, DC and Townhouse Fire: Washington, DC-What Happened examined the building and initial tactical operations at this incident. The fire occurred in the basement of a two-story, middle of building, townhouse style apartment with a daylight basement. 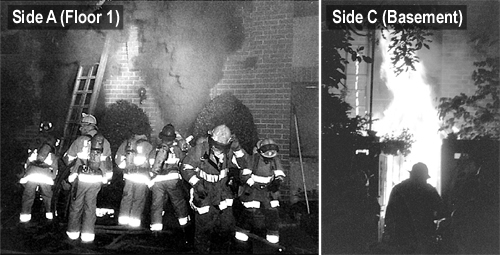 This configuration provided an at grade entrance to the Floor 1 on Side A and at grade entrance to the Basement on Side C.
Engine 26, the first arriving unit reported heavy smoke showing from Side A and observed a bi-directional air track at the open front door. First alarm companies operating on Side A deployed hoselines into the first floor to locate the fire. Engine 17, the second due engine, was stretching a hoseline to Side C, but had insufficient hose and needed to extend their line. Truck 4, the second due truck, operating from Side C opened a sliding glass door to the basement to conduct search and access the upper floors (prior to Engine 17’s line being in position). When the door on Side C was opened, Truck 4 observed a strong inward air track. As Engine 17 reached Side C (shortly after Rescue 1 and a member of Truck 4 entered the basement) and asked for their line to be charged, and Engine 17 advised Command that the fire was small. Proceeding from their entry point on Side C towards the stairway to Floor 1 on Side A, Rescue 1B and the firefighter from Truck 4 observed fire burning in the middle of the basement room. Nearing the stairs, temperature increased significantly and they observed fire gases in the upper layer igniting. Rescue 1B and the firefighter from Truck 4 escaped through the basement doorway on Side C as the basement rapidly transitioned to a fully developed fire. The timeline illustrated in Figure 1 is abbreviated and focuses on a limited number of factors. A detailed timeline, inclusive of tactical operations, fire behavior indicators, and fire behavior is provided in a subsequent section of the case. After Engine 17’s line was charged, the Engine 17 officer asked Command for permission to initiate fire attack from Side C. Command denied this request due to lack of contact with Engines 26 and 10 and concern regarding opposing hoselines. Due to their path of travel around Side B of the building, Engine 17 had not had a clear view of Side A and thought that they were at a doorway leading to Floor 1 (rather than the Basement). 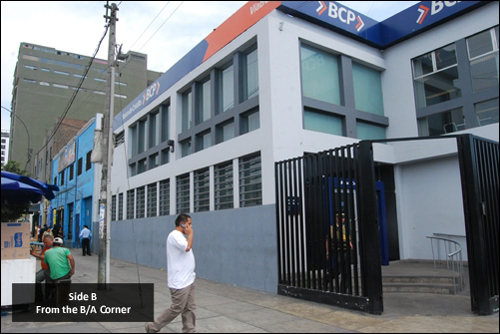 At this point, neither the companies on Side C nor Command recognized that the building had three levels on Side C and two levels on Side A. At this point crews from Engine 26 and 10 are operating on Floor 1 and conditions begin to deteriorate. 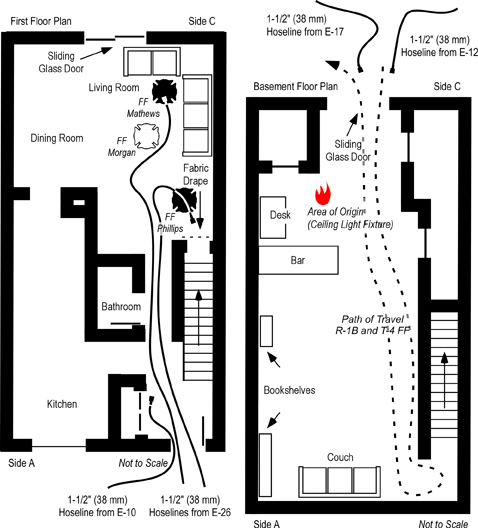 Firefighter Morgan (Engine 26) observed flames at the basement door in the living room (see Figure 8 which illustrates fire conditions in the basement as seen from Side C). Firefighter Phillips (Engine 10) knocked down visible flames at the doorway, but conditions continued to deteriorate. Temperature increased rapidly while visibility dropped to zero. As conditions deteriorated, Engine 26’s officer feels his face burning and quickly exits (without notifying his crew). In his rapid exit through the hallway on Floor 1, he knocked the officer from Engine 10 over. Confused about what was happening Engine 10’s officer exited the building as well (also without notifying his crew). Engine 26’s officer reports to Command that Firefighter Mathews was missing, but did not report that Firefighter Morgan was also missing. Appearing dazed, Engine 10’s officer did not report that Firefighter Phillips was missing. Note: From Report from the Reconstruction Committee: Fire at 3146 Cherry Road NE, Washington DC, May 30, 1999, p. 32. District of Columbia Fire & EMS, 2000. Note: From Report from the Reconstruction Committee: Fire at 3146 Cherry Road NE, Washington DC, May 30, 1999, p. 29. District of Columbia Fire & EMS, 2000. After the exit of the officers from Engine 26 and Engine 10, the three firefighters (Mathews, Phillips, and Morgan) remained on Floor 1. 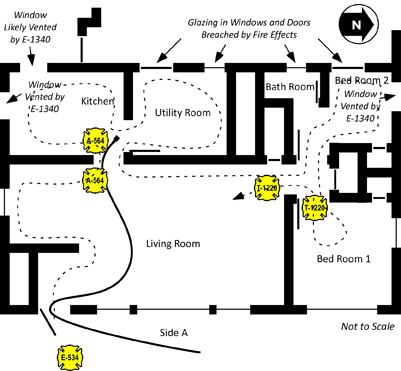 However, neither Command (Battalion 1) nor a majority of the other personnel operating at the incident recognized that the firefighters from Engines 26 and 10 had been trapped by the rapid extension of fire from the Basement to Floor 1 (see Figure 4). While at their apparatus getting a ladder to access the roof from Side B, Truck 4B observed the rapid fire development in the basement and pulled a 350′ 1-1/2″ (107 m 38 mm) line from Engine 12 to Side C, backing up Engine 17. 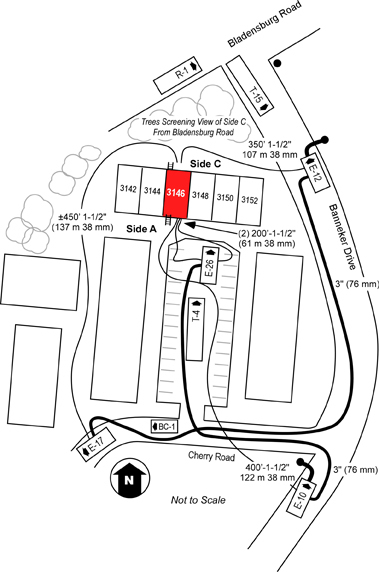 Note: Adapted from Report from the Reconstruction Committee: Fire at 3146 Cherry Road NE, Washington DC, May 30, 1999, p. 18 & 20. 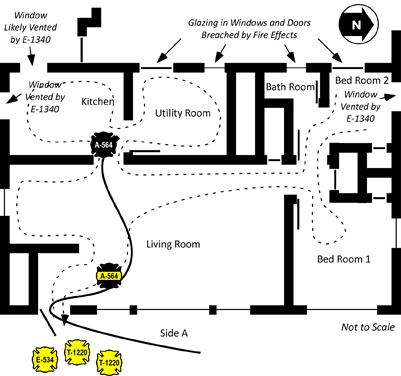 District of Columbia Fire & EMS, 2000 and Simulation of the Dynamics of the Fire at 3146 Cherry Road NE, Washington D.C., May 30, 1999, p. 12-13, by Daniel Madrzykowski & Robert Vettori, 2000. Gaithersburg, MD: National Institute of Standards and Technology. Engine 17 again contacted Command (Battalion 1) and requested permission to initiate an exterior attack from Side C. However, the officer of Engine 17 mistakenly advised Command that there was no basement entrance and that his crew was in position to attack the fire on Floor 1. Unable to contact Engines 10 and 26, Command denied this request due to concern for opposing hoselines. With conditions worsening, Command (Battalion 1) requested a Task Force Alarm at 00:29, adding another two engine companies, truck company, and battalion chief to the incident. Firefighter Phillips (E-10) attempted to retreat from his untenable position at the open basement door. He was only able to travel a short distance before he collapsed. Firefighter Morgan (E-26) heard a loud scream to his left and then a thud as if someone had fallen to the floor (possibly Firefighter Mathews (E-26)). Firefighter Morgan found the attack line and opened the nozzle on a straight stream, penciling the ceiling twice before following the hoseline out of the building (to Side A). Firefighter Morgan exited the building at approximately 00:30. Rescue 1B entered the structure on Floor 1, Side A to perform a primary search. They crawled down the hallway on Floor 1 towards Side C until they reached the living room and attempted to close the open basement door but were unable to do so. Rescue 1 B did not see or hear Firefighters Mathews (E-26) and Phillips (E-10) while working on Floor 1. Rescue 1B noted that the floor in the living room was spongy. 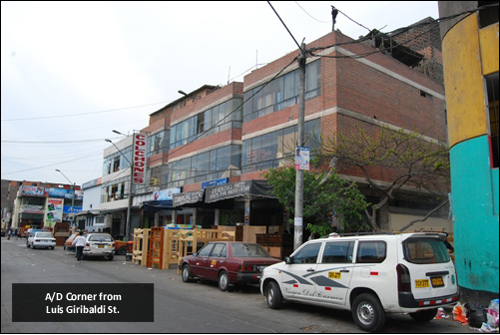 The Rescue 1 Officer ordered his B Team to exit, but instead they returned to the front door and then attempted to search Floor 2, but were unable to because of extremely high temperature. Unaware that Firefighter Phillips (E-10) was missing, Command tasked Engine 10� and Rescue 1A, with conducting a search for Firefighter Mathews (E-26). The Engine 10 officer entered Floor 1 to conduct the search (alone) while instructing another of his firefighters to remain at the door. Rescue 1A followed Engine 26’s 1-1/2″ (38 mm) hoseline to Floor 1 Slide C. Rescue 1B relocated to Side B to search the basement for the missing firefighter. The Engine 26 Officer again advised Command (Battalion 1) that Firefighter Mathews was missing. Engine 17 made a final request to attack the fire from Side C. Given that a firefighter was missing and believing that the fire had extended to Floor 1, Command instructed Engine 17 to attack the fire with a straight stream (to avoid pushing the fire onto crews working on Floor 1). At approximately 00:33, Battalion 2 reported (from Side C) that the fire was darkening down. Engine 14 arrived and staged on Bladensburg Road. Command ordered a second alarm assignment at 00:34 hours. At 00:36, Command ordered Battalion 2 (on Side C) to have Engine 17 and Truck 4 search for Firefighter Mathews in the Basement. Engine 10’s officer heard a shrill sound from a personal alert safety system (PASS) and quickly located Firefighter Phillips (E-10). Firefighter Phillips was unconscious, lying on the floor (see Figure 4) with his facepiece and hood removed. Unable to remove Firefighter Phillips by himself, the officer from Engine 10 unsuccessfully attempted to contact Command (Battalion 1) and then returned to Side A to request assistance. Command received a priority traffic message at 00:37, possibly attempting to report the location of a missing firefighter. However, the message was unreadable. The Hazmat Unit and Engine 6 arrived and staged on Bladensburg Road and a short time later were tasked by Command to assist with rescue of the downed firefighter on Floor 1. Firefighter Phillips (E-10) was removed from the building by the Engine 10 officer, Rescue 1A, Engine 6, and the Hazardous Materials Unit at 00:45. After Firefighter Phillips was removed to Side A, Command discovered that Firefighter Mathews (E-26) was still missing and ordered the incident safety officer to conduct an accountability check. Safety attempted to conduct a personnel accountability report (PAR) by radio, but none of the companies acknowledged his transmission. The Deputy Chief of the Firefighting Division arrived at 00:43 and assumed Command, establishing a fixed command post at the Engine 26 apparatus. Battalion 4 arrived a short time later and was assigned to assist with rescue operations along with Engines 4 and 14. 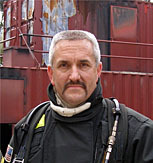 Firefighter Mathews was located simultaneously by several firefighters. He was unconscious leaning over a couch on Side C of the living room (see Figure 4). Firefighter Mathews breathing apparatus was operational, but he had not activated his (non-integrated) personal alert safety system (PASS). Firefighter Mathews was removed from the building by Engine 4, Engine 14, and Hazardous Materials Unit at 00:49. Command (Deputy Chief) ordered Battalions 2 and 4 to conduct a face-to-face personnel accountability report on Sides A and C at 00:53. 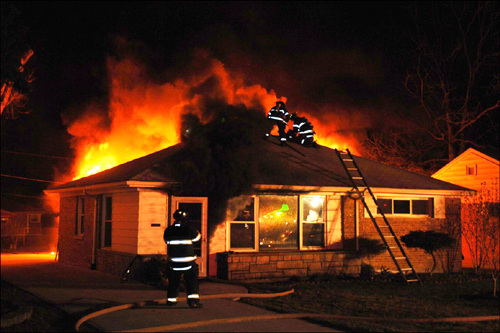 National Institute for Occupational Safety and Health (NIOSH) Death in the Line of Duty Reports examining incidents involving extreme fire behavior often recommend close coordination of fire attack and ventilation. Did the fire behavior in this incident match the prediction you made after reading the previous post (Towhouse Fire: Washington DC-What Happened)? What type of extreme fire behavior occurred? Justify your answer? What event or action initiated the extreme fire behavior? Why do you believe that this is the case? 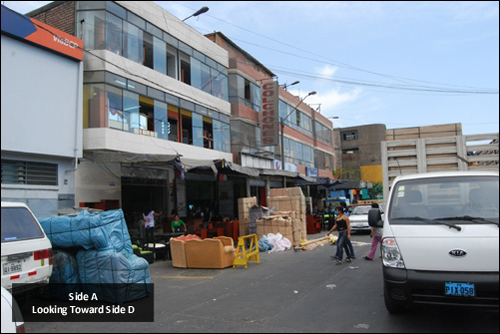 How might a building pre-plan and/or 360o reconnaissance have impacted the outcome of this incident? 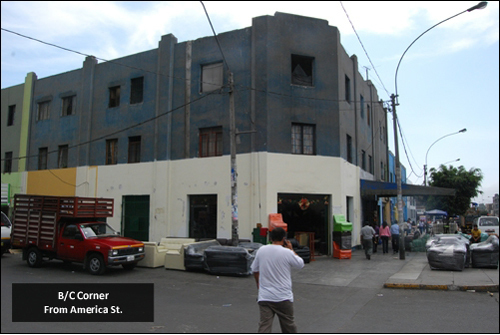 Note that 360o reconnaissance does not necessarily mean one individual walking completely around the building, but requires communication and knowledge of conditions on all sides of the structure (e.g., two stories on Side A and three stories on Side C). How might the outcome of this incident have changed if Engine 17 had been in position and attacked the fire in the basement prior to Engines 26 and 10 committing to Floor 1? What strategies and tactics might have been used to mitigate the risk of extreme fire behavior during this incident? 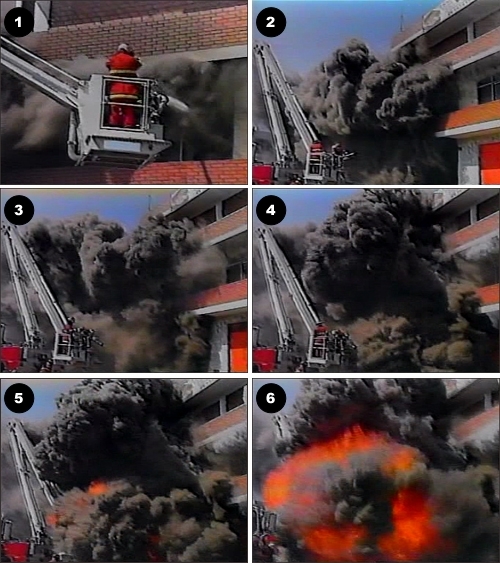 This incident was one of the first instances where the National Institute of Standards and Technology (NIST) Fire Dynamics Simulator (FDS) was used in forensic fire scene reconstruction (Madrzykowski & Vettori, 2000). Modeling of the fire behavior in this incident helps illustrate what was likely to have happened in this incident. 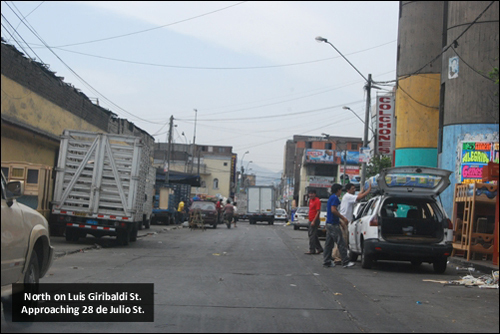 The next post in this series will examine and expand on the information provided by modeling of this incident. 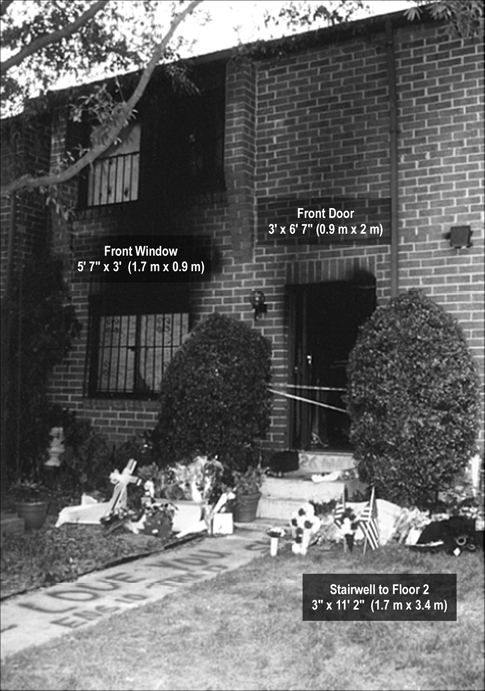 This post continues study of an incident that resulted in two line-of-duty deaths as a result of extreme fire behavior in a townhouse style apartment building in Washington, DC. 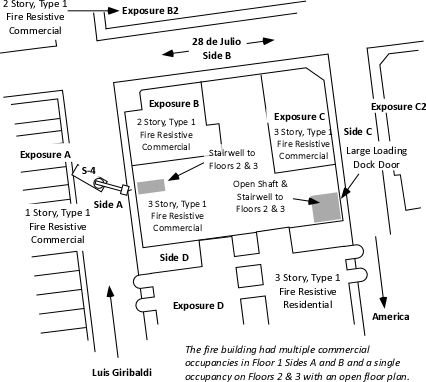 The previous post in this series, Fire Behavior Case Study of a Townhouse Fire: Washington, DC examined building construction and configuration that had a significant impact on the outcome of this incident. 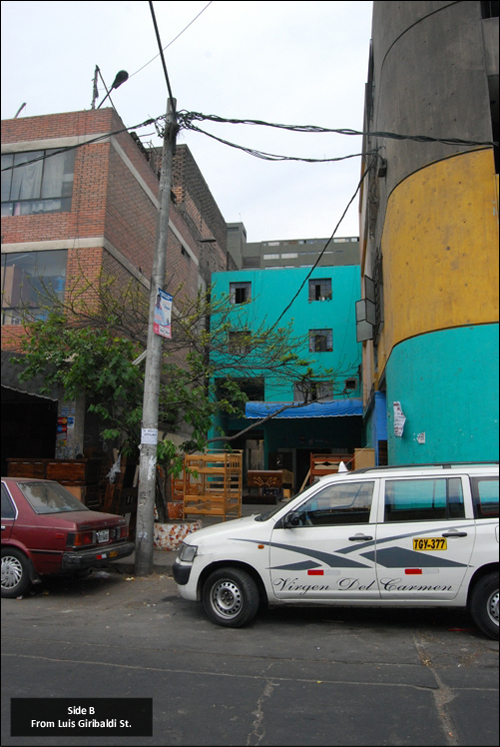 The fire occurred in the basement of a two-story, middle of building, townhouse style apartment with a daylight basement. 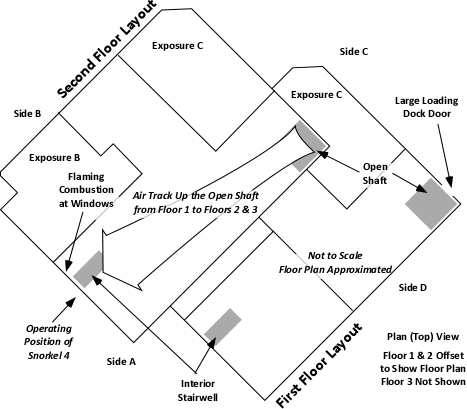 This configuration provided an at grade entrance to the Floor 1 on Side A and an at grade entrance to the Basement on Side C.
The fire originated in an electrical junction box attached to a fluorescent light fixture in the basement ceiling (see Figures 1 and 2). The occupants of the unit were awakened by a smoke detector. The female occupant noticed smoke coming from the floor vents on Floor 2. She proceeded downstairs and opened the front door and then proceeded down the first floor hallway towards Side C, but encountered thick smoke and high temperature. The female and male occupants exited the structure, leaving the front door open, and made contact with the occupant of an adjacent unit who notified the DC Fire & EMS Department at 0017 hours. At 00:17, DC Fire & EMS Communications Division dispatched a first alarm assignment consisting of Engines 26, 17, 10, 12, Trucks 15, 4, Rescue Squad 1, and Battalion 1 to 3150 Cherry Road NE. At 0019 Communications received a second call, reporting a fire in the basement of 3146 Cherry Road NE. Communications transmitted the update with the change of address and report of smoke coming from the basement. However, only one of the responding companies (Engine 26) acknowledged the updated information. Temperature was approximately 66o F (19o C) with south to southwest winds at 5-10 mi/hr (8-16 km/h), mostly clear with no precipitation. Approaching the incident, Engine 26 observed smoke blowing across Bladensburg Road. Engine 26 arrived at a hydrant at the corner of Banneker Drive and Cherry Road at 00:22 hours and reported smoke showing. A short time later, Engine 26 provided an updated size-up with heavy smoke showing from Side A of a two story row house. Based on this report, Battalion 1 ordered a working fire dispatch and a special call for the Hazmat Unit at 00:23. This added Engine 14, Battalion 2, Medic 17 and EMS Supervisor, Air Unit, Duty Safety Officer, and Hazmat Unit. DC Fire and EMS Department standard operating procedures (SOP) specify apparatus placement and company assignments based on dispatch (anticipated arrival) order. Note that dispatch order (i.e., first due, second due) may de different than order of arrival if companies are delayed by traffic or are out of quarters. The first due engine lays a supply line to Side A, and in the case of basement fires, the first line is positioned to protect companies performing primary search on upper floors by placing a line to cover the interior stairway to the basement. The first due engine is backed up by the third due engine. The apparatus operator of the third due engine takes over the hydrant and pumps supply line(s) laid by the first due engine, while the crew advances a backup line to support protection of interior exposures and fire attack from Side A. The first due truck takes a position on Side A and is responsible for utility control and placement of ladders for access, egress, and rescue on Side A. If not needed for rescue, the aerial is raised to the roof to provide access for ventilation. The rescue squad positions on Side A (unless otherwise ordered by Command) and is assigned to primary search using two teams of two. One team searches the fire floor, the other searches above the fire floor. The apparatus operator assists by performing forcible entry, exterior ventilation, monitoring search progress, and providing emergency medical care as necessary. The second due engine lays a supply line to the rear of the building (Side C), and in the case of basement fires, is assigned to fire attack if exterior access to the basement is available and if it is determined that the first and third due engines are in a tenable position on Floor 1. 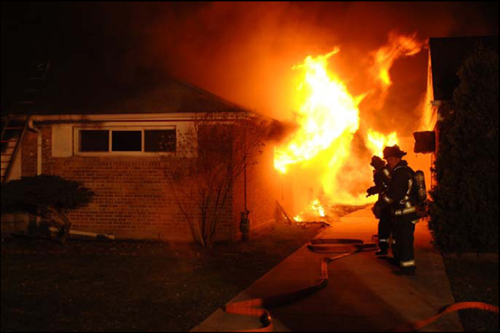 The second due engine is responsible for checking conditions in the basement, control of utilities (on Side C), and notifying Command of conditions on Side C. Command must verify that the first and third due engines can maintain tenable positions before directing the second due engine to attack basement fires from the exterior access on Side C.
The second due truck takes a position on Side C and is responsible for placement of ladders for access, egress, and rescue on Side C. The aerial is raised to the roof to provide secondary access for ventilation (unless other tasks take priority). The battalion chief positions to have an unobstructed view of the incident (if possible) and uses his vehicle as the command post. On greater alarms, the command post is moved to the field command unit. 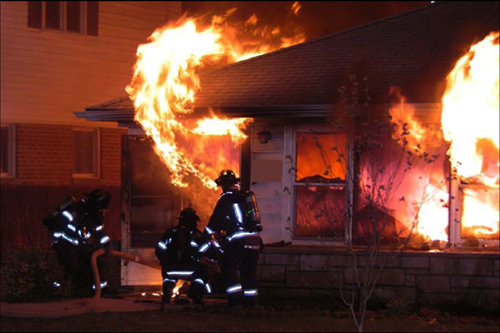 Notes: This summary of DC Fire & EMS standard operating procedures for structure fires is based on information provided in the reconstruction report and reflects procedures in place at the time of the incident. DC Fire & EMS did not use alpha designations for the sides of a building at the time of this incident. However, this approach is used here (and throughout the case) to provide consistency in terminology. First due, Engine 26 laid a 3″ (76 mm) supply line from a hydrant at the intersection of Banneker Drive and Cherry Road NE, positioned in the parking lot on Side A, and advanced a 200′ 1-1/2″ ( 61 m 38 mm) pre-connected hoseline to the first floor doorway of the fire unit on Side A (see Figures 1 and 2). A bi-directional air track was evident at the door on Floor 1, Side A , with thick (optically dense) black smoke from the upper area of the open doorway. Engine 26’s entry was delayed due to a breathing apparatus facepiece malfunction. The crew of Engine 26 (Firefighters Mathews and Morgan and the Engine 26 Officer) made at approximately 00:24. Engine 10, the third due engine arrived shortly after Engine 26, took the hydrant at the intersection of Banneker Drive and Cherry Road, NE, and pumped Engine 26’s supply line. After Engine 10 arrived at the hydrant, the firefighter from Engine 26 who had remained at the hydrant proceeded to the fire unit and rejoined his crew. Engine 10, advanced a 400′ 1-1/2″ (122 m 38 mm) line from their own apparatus as a backup line. Firefighter Phillips and the Engine 10 officer entered through the door on Floor 1, Side A (see Figure 2) while the other member of their crew remained at the door to assist in advancing the line. Truck 15, the first due truck arrived at 00:23 and positioned on Side A in the parking lot behind Engine 26. The crew of Truck 15 began laddering Floor 2, Side A, and removed kitchen window on Floor 1, Side A (see Figure 2). Due to security bars on the window, one member of Truck 15 entered the building and removed glass from the window from the interior. After establishing horizontal ventilation, Truck 15 accessed the roof via a portable ladder and began vertical ventilation operations. Engine 17, the second due engine, arrived at 00:24, laid a 3″ (76 mm) supply line from the intersection of Banneker Drive and Cherry Road NE, to a position on Cherry Road NE just past the parking lot, and in accordance with department procedure, stretched a 350′ 1-1/2″ (107 m 38 mm) line to Side C (see Figure 2). Approaching Cherry Road from Banneker Drive, Battalion 1 observed a small amount of fire showing in the basement and assigned Truck 4 to Side C. Battalion 1 parked on Cherry Road at the entrance to the parking lot, but was unable to see the building, and proceeded to Side A and assumed a mobile command position. Second due, Truck 4 proceeded to Side C and observed what appeared to be a number of small fires in the basement at floor level (this was actually flaming pieces of ceiling tile which had dropped to the floor). 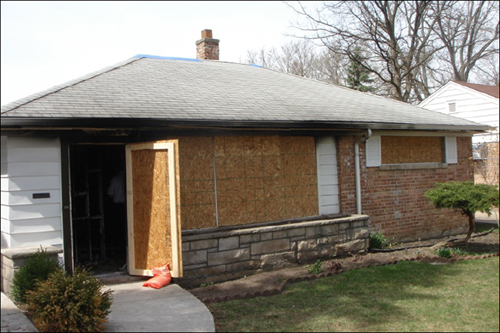 The officer of Truck 4 did not provide a size-up report to Command regarding conditions on Side C. Truck 4, removed the security bars from the basement sliding glass door using a gasoline powered rotary saw and sledgehammer. After clearing the security grate Truck 4, broke the right side of the sliding glass door to ventilate and access the basement (at approximately 00:27) and then removed the left side of the sliding glass door. The basement door on Side C was opened prior to Engine 17 getting a hoseline in place and charged. After opening the sliding glass door in the basement, Truck 4 attempted to ventilate windows on Floor 2 Side C using the tip of a ladder. 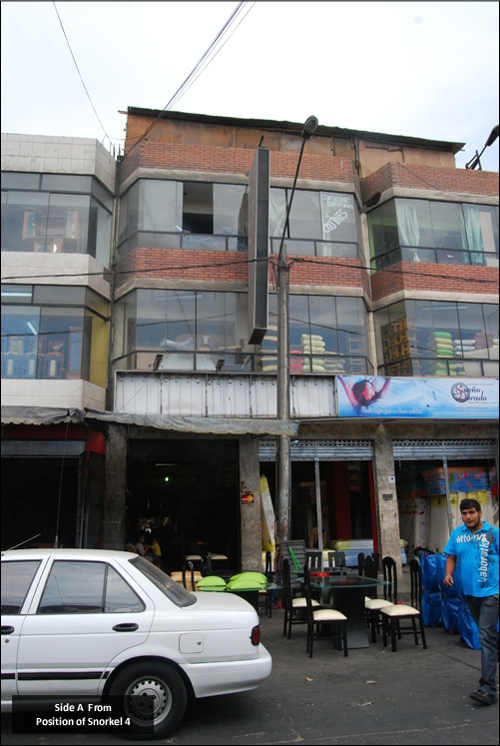 They did not hear the glass break and believing that they had been unsuccessful; they left the ladder in place at one of the second floor windows and continued with other tasks. 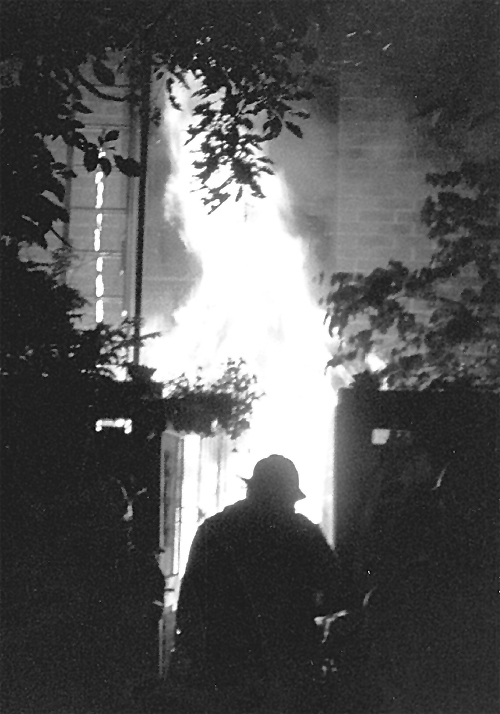 Note: Adapted from Report from the Reconstruction Committee: Fire at 3146 Cherry Road NE, Washington DC, May 30, 1999, p. 27. District of Columbia Fire & EMS, 2000. Unknown to Truck 4, these windows had been left open by the exiting occupants. Truck 4B (two person team from Truck 4) returned to their apparatus for a ladder to access the roof from Side C. Rescue 1 arrived at 00:26 and reported to Side C after being advised by the male occupant that everyone was out of the involved unit (this information was not reported to Command). Rescue 1 and Truck 4 observed inward air track (smoke and air) at the exterior basement doorway on Side C and an increase in the size of the flames from burning material on the floor. Engines 26 and 10 encountered thick smoke and moderate temperature as they advanced their charged 1-1/2″ (38 mm) hoselines from the door on Side A towards Side C in an attempt to locate the fire. As they extended their hoselines into the living room, the temperature was high, but tolerable and the floor felt solid. 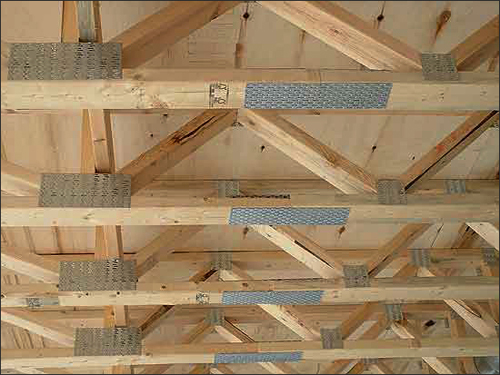 It is important to note that engineered, lightweight floor support systems such as parallel chord wood trusses do not provide reliable warning of impending failure (e.g., sponginess, sagging), failure is often sudden and catastrophic (NIOSH, 2005; UL, 2009). 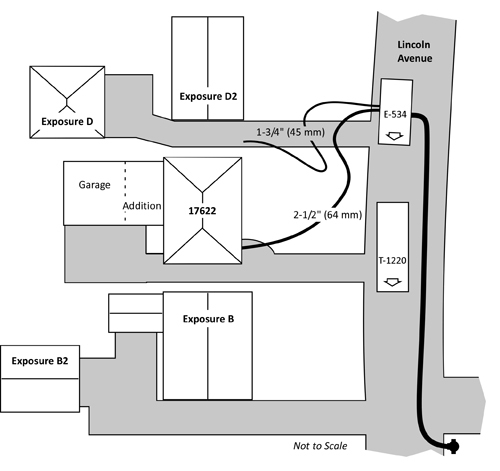 Prior to reaching Side C of the involved unit, Engine 17 found that their 350′ 1-1/2″ (107 m 38 mm) hoseline was of insufficient length and needed to extend the line with additional hose. Engine 12, the fourth arriving engine, picked up Engine 17’s line, completed the hoselay to a hydrant on Banneker Drive (see Figure 2). The crew of Engine 12 then advanced a 200′ 1-1/2″ (61 m 38 mm) hoseline from Engine 26 through the front door of the involved unit on Side A and held in position approximately 3′ (1 m) inside the doorway. This tactical action was contrary to department procedure, as the fourth due engine has a standing assignment to stretch a backup line to Side C.
Rescue 1’s B Team (Rescue 1B) and a firefighter from Truck 4 entered the basement without a hoseline in an effort to conduct primary search and access the upper floors via the interior stairway. Engine 17 reported that the fire was small and requested that Engine 17 apparatus charge their line. 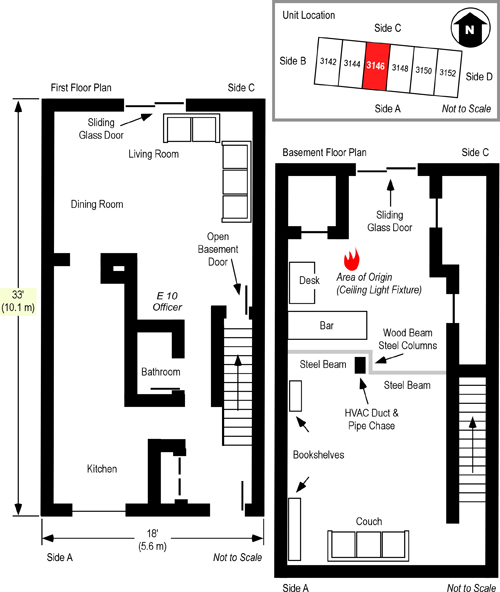 Based on the information provided to this point, what was the stage of fire development and burning regime in the basement when Engine 26 entered through the door on Floor 1, Side A? What leads you to this conclusion? What impact do you believe Truck 4’s actions to open the Basement door on Side C will have on the fire burning in the basement? Why? What is indicated by the strong inward flow of air after the Basement door on Side C is opened? 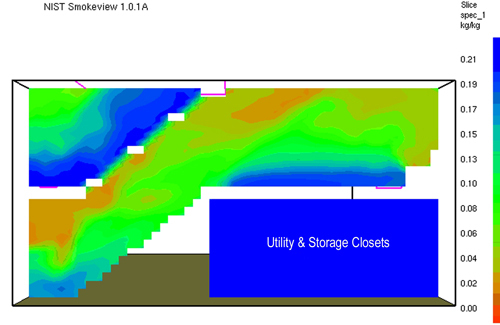 How will this change in ventilation profile impact on air track within the structure? Did the companies at this incident operate consistently with DC Fire & EMS SOP? If not, how might this have influenced the effectiveness of operations? 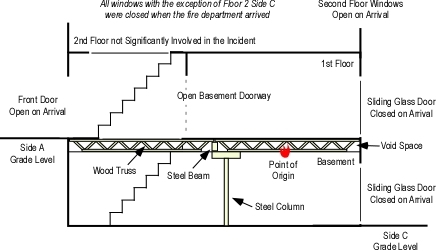 Committing companies with hoselines to the first floor when a fire is located in the basement may be able to protect crews conducting search (as outlined in the DC Fire & EMS SOP). 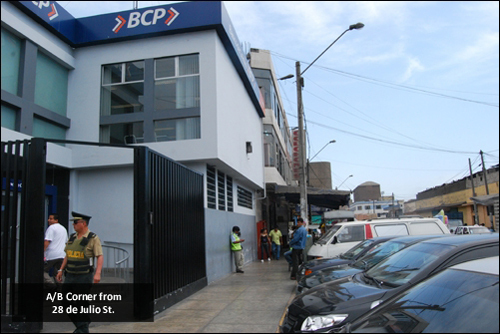 However, what building factors increased the level of risk of this practice in this incident? My next post will examine the extreme fire behavior phenomena that trapped Firefighters Phillips, Mathews, and Morgan and efforts to rescue them. This week marked the anniversary of the largest loss of life in a line-of-duty death incident in the history of the American fire service. Each September, we stop and remember the sacrifice made by those 343 firefighters. However, it is also important to remember and learn from events that take the lives of individual firefighters. In an effort to encourage us to remember the lessons of the past and continue our study of fire behavior, each month I include brief narratives and links to NIOSH Death in the Line of Duty reports and other documentation in my posts. Captain Neglia and other firefighters were dispatched to a report of fire in a three-story apartment building in Union City. Upon their arrival at the scene, firefighters found light smoke and no visible fire. Based on reports that the structure had not been evacuated, Captain Neglia and other firefighters entered the building to perform a search. Due to the light smoke conditions, Captain Neglia was not wearing his facepiece. Captain Neglia was the first firefighter to enter an apartment. Conditions deteriorated rapidly as fire in the cockloft broke through a ceiling . Captain Neglia was trapped by rapid fire progress and subsequent collapse. Other firefighters came to his aid and removed him from the building. Captain Neglia was transported to the hospital but later died of a combination of smoke inhalation and burns. NIOSH did not investigate and prepare a report on the incident that took the life of Captain Neglia.